I decided to try and write a 50,000-word novel completely from scratch in the 30 days of November 2012 while also carrying on with my full-time day job! It was all for fun as part of National Novel Writing Month, but I also dedicated it to a good cause, doing it in aid of Redwings Horse Sanctuary. YOU CAN READ THE RAW UNEDITED NOVEL HERE. 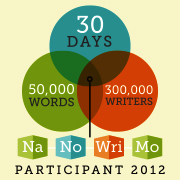 Towards the end of October 2012 I found out there was this thing called NaNoWriMo where you are supposed to write a novel of 50,000 words or more from scratch in the 30 days of November. Some people seem to have the novel all planned out in advance and spend November just writing it down. Other people just start writing and see what turns out. There's no rule about the novel necessarily having to be any good! As of today I have no idea what my novel will be about, or even what genre or style it will be in. I also have absolutely no idea how on earth I am going to find the time to write a 50,000 word novel during what is one of my busiest times of year at work! Well it was all finished and submitted on 29th November with a day to spare. It's a bit rough, but it fulfilled the criteria: it was 50,000 words of novel written completely from scratch in th emonth of November. They sent me a winner's certificate and everything! I have posted the novel (in its unedited and unchecked form, errors still included) on these web pages - except for the last chapter. Why have I not put up the last chapter? Partly because I am thinking of extending the last chapter that I wrote and developing the story further, so I don't want to "close it off" publicly yet. If anybody does want to see it, and wants to read the whole thing in this "original" state, I'll be happy to give a copy of the last chapter to anybody who sponsored me!